Extra Credits: Bartle’s Taxonomy was the earliest attempt to break down player psychology in a multiplayer environment. Richard Bartle, who created the first MUD in 1978, interviewed the players of his games about why they played. 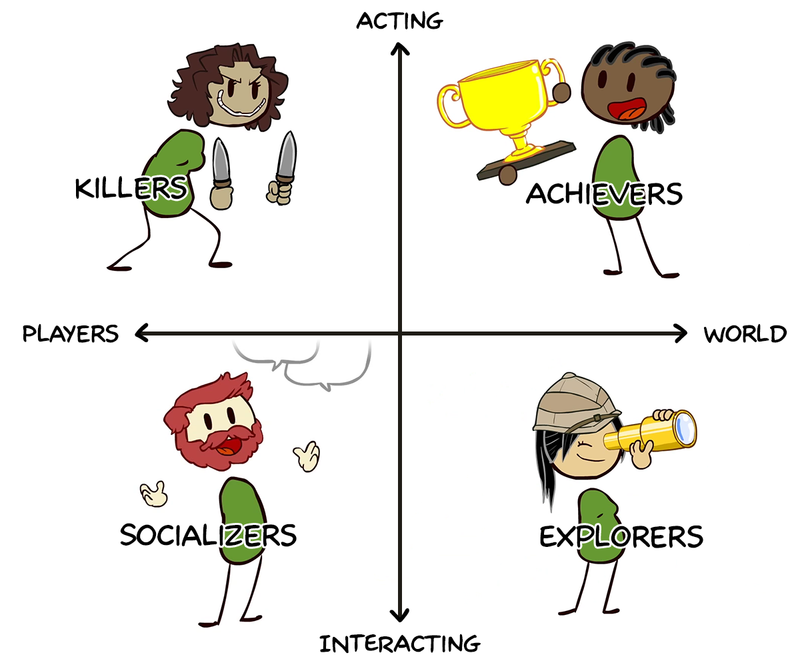 Their responses fit into four categories, which we now call Achievers, Explorers, Socializers, and Killers. Achievers focus on in-game goals like getting high scores or collecting gold. Explorers seek to discover new locations on the map or new ways to use the mechanics. Socializers come to meet people, often organizing guilds or collecting on social forums. Killers seek to dominate other players, usually by killing them in PvP. Bartle went further than creating these four categories, however: he also mapped them to a graph with Action-Interaction on one axis and Player-World on the other. This simple graph helps developers evaluate new content: what category does it fall into, and therefore what type of gameplay does it encourage? Bartle’s Taxonomy provides rough guidelines for understanding the types of motivations that players have. It also allows us to appeal to those players in broad groups, for example, providing easter eggs to lure in Explorer type players. These players groups also have a natural synergy with each other: for example, killers like to prey upon achievers, so they require a population of achievers to enjoy the game. But if there are too many killers, then it gets in the way of any achievers succeeding at their own goals, so game designers have to make sure that they balance these populations by keeping track of what type of gameplay they’re encouraging most when they add features. The Bartle Test of Gamer Psychology on Wikipedia.